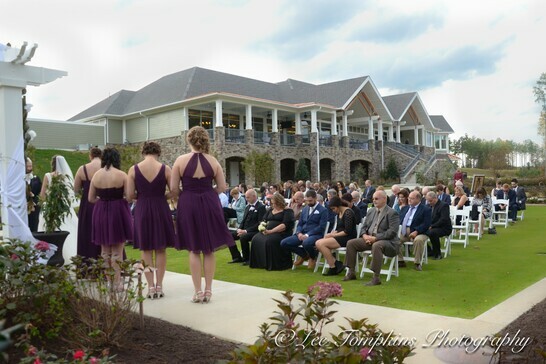 Let Magnolia Green host your wedding or upcoming event. Our team cares about every detail and will work tirelessly to make sure every moment is executed perfectly. Magnolia Green Golf Club is dedicated to making your dreams come true. We provide a professional team that helps make your day as wonderful as you could have imagined it. Our culinary team has the expertise to cultivate a customized menu for your special event. 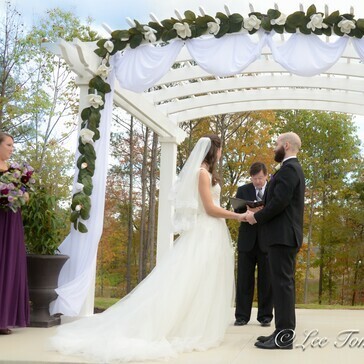 The wedding lawn backs up to our tenth tee box and overlooks hole #18, so you are surrounded by the picturesque backdrop of our award winning course as you say “I do” under the white wooden Arbor. 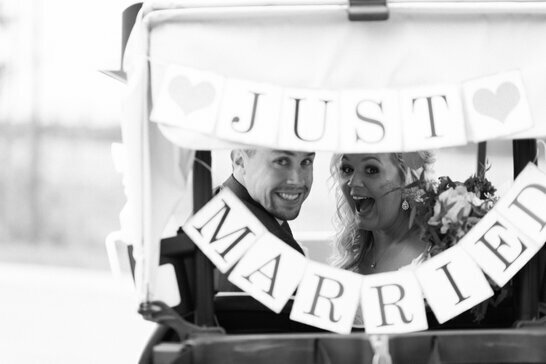 Our team is here to make your big day a memorable one for all in attendance! For more information, please contact Alissa Tarr at 804.639.5701 x 204 or complete the inquiry form below and we will get back to you shortly! "Good morning, Just wanted to thank you again for such a beautiful day at Sarah’s wedding last weekend. 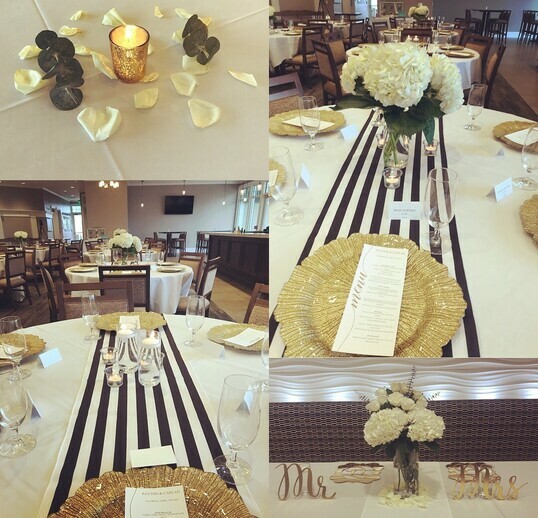 The venue looked gorgeous and all the work you and your staff put in that day did not go unnoticed. The wait staff was exceptional, the food was delicious and your team was there all night to get us anything we needed. My Facebook has been blowing up with so many pictures and compliments of how beautiful the venue was. Most had not been there before and loved the venue. I hope you got pictures but I’ll tag you with some I received. I am happy to recommend this venue to others." "Alissa, your outstanding professional service and advice put me at ease prior to and throughout the entire event. Dr. Royal was so impressed in the friendliness given to her when she retrieved her lost cell phone the next day from. I can certainly see why people have weddings, birthday parties, etc at the club. They, as I, are certain to get superb service. Hopefully when the weather clears, hubby will be out on the greens. Again, thanks so, so much for being available to me for my event and making it so memorable." "Hi Alissa, I wanted to reach out thank you and your staff again for everything you did to make my son’s baptism party spectacular. We had a blast! The food and service was great. We are thinking we would like to host a Holiday party with you or perhaps a surprise birthday party at the beginning of next year. We will stay in touch and look forward to seeing you again at the Clubhouse soon! Thanks again!!'" Check Out the Clubhouse Renderings! 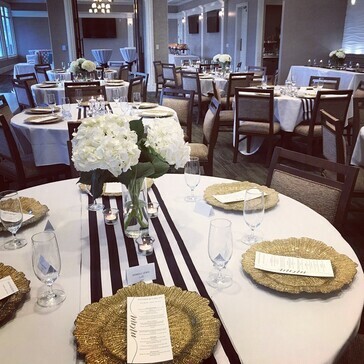 Our Director of Sales, Alissa Tarr, looks forward to connecting with you about Weddings & Banquets at Magnolia Green Golf Club. Please complete this form to request information. We look forward to speaking with you soon. Thank you! Thank you for requesting information about hosting at Magnolia Green Golf Club. Our Sales Director will be in touch with you shortly to discuss the details!